[163 Pages Report] The street and roadway lighting market is expected to grow at a CAGR of 6.03% during the forecast period to reach USD 10.94 Billion by 2022. The base year used for the study is 2015 and the forecast period is between 2016 and 2022. This report provides a detailed analysis of the street and roadway lighting market based on lighting type, light source, wattage type, end user, offering, and geography. It has been estimated that the LED light source would hold a large share of the street and roadway lighting market during the forecast period. However, the street and roadway lighting market for smart lighting is expected to grow at the highest CAGR between 2016 and 2022. Finalizing the overall market size by triangulation with supply-side data, which includes product developments, supply chain, and estimated sales of the street and roadway lighting market. After arriving at the overall market size, the total market has been split into several segments and subsegments and confirmed with the key industry experts. 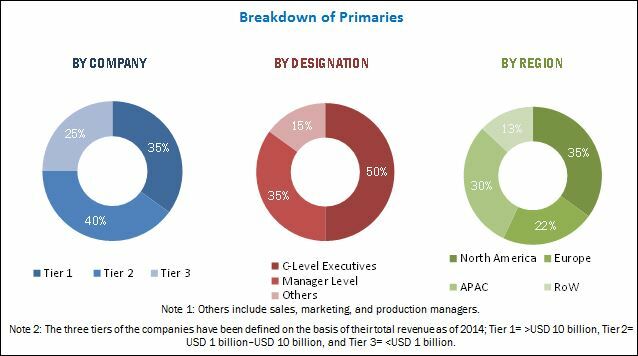 The following figure depicts the breakdown of primaries on the basis of company, designation, and region. The street and roadway lighting market ecosystem includes component suppliers such as ClaroLux Landscape Lighting (U.S.), Forus Electric Private Limited (India), Shenzhen GHC Co., Ltd. (China), and Shenzhen HXD Lighting Co., Ltd. (China); lighting manufacturers such as Cree, Inc. (U.S.), Acuity Brands Lighting, Inc. (U.S.), Koninklijke Philips N.V. (Netherlands), and OSRAM Licht GmbH (Germany); and system integrators such as WS Atkins plc (U.K.), MMA Lighting Consultancy Ltd. (U.K.), Lighting Reality Ltd (U.K.), and General Electric Company (U.S.). This research report categorizes the overall street and roadway lighting market on the basis of lighting type, light source, wattage type, end user, offering, and region. 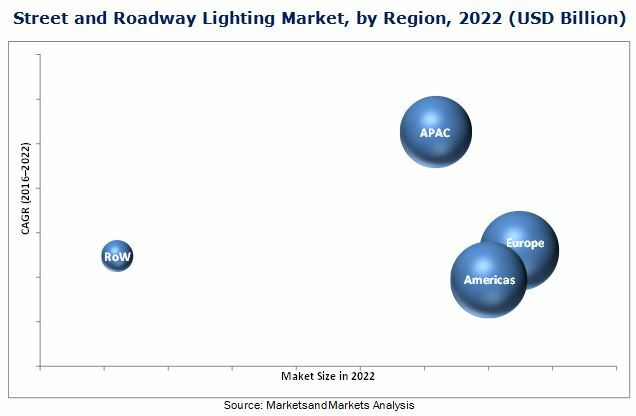 According to the MarketsandMarkets forecast, the street and roadway lighting market is expected to be valued at USD 10.94 Billion by 2022, growing at a CAGR of 6.03% between 2016 and 2022. The growth of the street and roadway lighting market could be attributed to the modernization and development of infrastructure such as smart cities, need for energy-efficient street lighting systems, increasing penetration of LED lights and luminaires in street lighting applications, and stringent rules and regulations by governments. However, the high installation cost of smart lighting and lack of awareness about the payback period are the restraints for the street and roadway lighting market. Of all the major hardware components, luminaires are expected to dominate the street and roadway lighting market during the forecast period. The services segment is expected to witness the highest growth from 2016 to 2022. The growth of the services segment is mainly propelled by the use of smart street lighting for energy conservation and high efficiency. Smart street lighting comprises pre-installation and post-installation services such as installation, design, maintenance, support, and monitoring services. Among all the end users, street and roadways held the largest share of the street and roadway lighting market in 2015. The key reason for the growth of the street and roadways segment is rapid urbanization and expansion of cities around the globe. The market for the street and roadways segment in APAC is expected to grow at the highest CAGR between 2016 and 2022. The major reason driving the growth of this segment in the APAC region is need for improvement in visibility and safety of drivers, riders, and pedestrians, thereby minimizing road accidents. Moreover, modernization and development of infrastructure across various countries such as India, China, Japan, and South Korea is driving the demand for lighting in street and roadways applications in the APAC region. The street and roadway lighting market based on lighting type comprises conventional lighting and smart lighting. The market for smart lighting is expected to grow at the highest rate between 2016 and 2022 as the adoption of smart lighting is growing rapidly with the growth of industries and cities. Until recently, illuminating the dark was the main task of street lighting. However, smart street lighting is expected to perform many more functions in the future. It would notify or register a change in traffic volume and feed that data into an intelligent transport system (ITS). Smart street lighting would be a part of a networked urban infrastructure. This acts as a driver for the growth of smart street lighting during the forecast period. The market for conventional lighting is expected to grow at a CAGR of 3.06% between 2016 and 2022 as in the APAC region, South Asian countries such as India, Maldives, Sri Lanka, Nepal, Bhutan, and Bangladesh would have larger share of conventional lighting than smart lighting. Of all the regions, Europe held the largest share of the market, and APAC is expected to grow at the highest CAGR between 2016 and 2022. In APAC, the growth is attributed to the modernization and development of infrastructure such as smart cities across the region. For instance, India came up with a list of 100 new smart cities in 2014; Union Budget of India allocated USD 1.0 billion for smart city projects. Furthermore, Europe is expected to dominate the global street and roadway lighting market due to stringent government regulations pertaining to lighting efficiency by European countries such as Germany, France, and Italy. The major players in the street and roadway lighting market are Koninklijke Philips N.V. (Netherlands), General Electric Company (U.S.), Cree, Inc. (U.S.), and Acuity Brands, Inc. (U.S.), OSRAM Licht AG (Germany), Eaton Corp Plc. (Ireland), and Hubbell Incorporated (U.S.), among others. These players have adopted various strategies such as product developments, partnerships, contracts, and business expansions to cater to the needs of the street and roadway lighting market.